1. In the past three weeks we’ve been fortunate to have received some additional press for Miki’s recent paper mentioned in the prior post. Beyond being a ‘Highlighted Paper‘ in the March issue of Genetics, we were kindly recommended by Deborah Charlesworth of the Faculty of 1000, and the Harvard Gazette ran an article about it, too. 2. Back on Darwin’s birthday (12 February) I went to the Belmont Media Center to feature in an episode of Contemporary Science Issues and Innovations on “Microbe Evolution.” It was good fun talking about aspects of our work on the evolution of cooperation in multi-species microbial consortia, particularly given an enthusiastic of high school biology students (earning extra credit for attendance). 3. Finally, thanks to a very kind nomination by my PhD advisor, Mary Lidstrom, I was named an ASM Distinguished Lecturer for 2013-2015. I am looking forward to the opportunity to speak at ASM Branches over the next couple years. 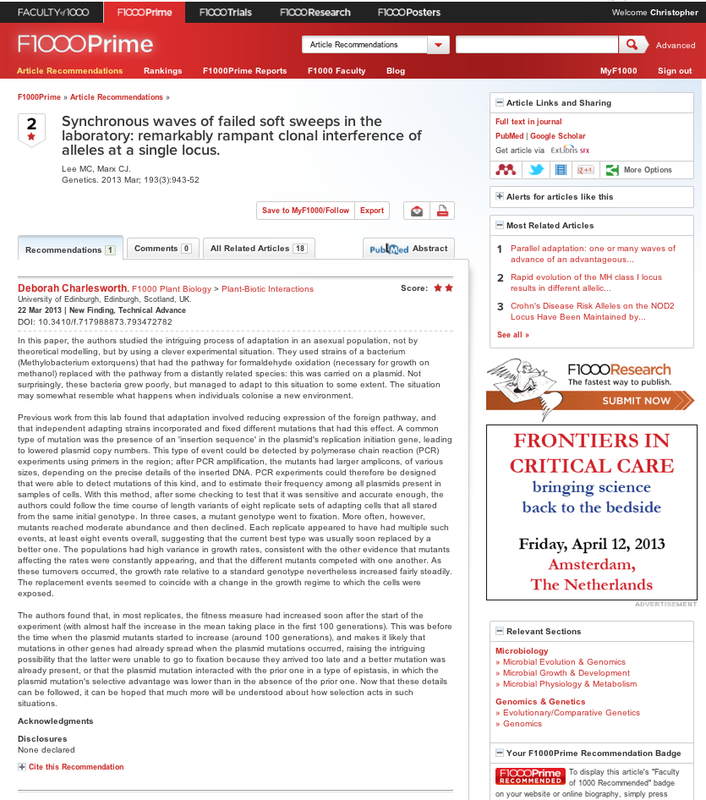 This entry was posted in publications, research on March 27, 2013 by cmarx2014.